Both of these teams come into this Eurocup Group B game with a 0-1 record, so there will be a lot of pressure and drama in Bilbao in this game. The sides have clashed before, back in 2009, and their record stands at 1-1, so there is everything to play for. The away side have the greater pedigree, coming into this game with two Eurocup triumphs under their belt but this will count for very little when the game gets underway. The fact that Bilbao have already lost at home puts them under a great deal of pressure. They can’t really afford to lose their opening two home games of an eight-game regular season, and this means the players have to take possession and be brave in this game. Michael Eric scored 15 points in the last game and he was supported by Dejan Todorovic, who grabbed 12 points and Scott Bamforth, who picked up 11 points in the defeat. These are the players who will be crucial to grabbing a home win and if they reach a strong level of performance, the home fans are likely to be quite happy about this game. Rytas lost their most recent game despite the sterling efforts of Drew Gordon. He managed to deliver a double-double of 21 points and 14 rebounds. He will be looking for more from his team-mates going into this game and Arturas Gudaitis, who grabbed 17 points in the loss, and Corey Fisher, who picked up 13 points in the defeat, have the capabilities to grab more points for their team. Rytas grabbed 41 rebounds in their defeat while the hosts only managed 27 rebounds, so this could be an area where the away side has an advantage going into this game. The hosts are well tipped to win this game and their drive and determination to kick-start their season should have an impact on this performance. 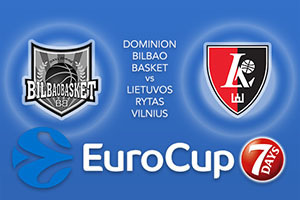 You can take Dominion Bilbao Basket at -7.0, which is on offer at odds of 1.90. If you’re looking for the Over/Under market, look to go UNDER 160.5 which you can find at odds of 1.90. Bet Now!